What elements of The Jim Henson Hour, in your mind, didnt seem to gel? WHITMIRE: Well, we never really knew where they were exactly. It was a strange thing. I dont think the audience ever had a sense of where the show was based. It was this odd control room place, but geographically, where was the studio? It just never seemed to quite come together. We did some funny sketches in it, but we were trying to do a lot of real edgy humor. It just didnt know what it was. It kept changing faces over and over again. Some of the individual pieces, I think, were really good, but to me, Muppets Tonight always seemed very similar to The Jim Henson Hour. They kill them by moving them around so much. I guess thats their way of finding out whether the audience follows the show, but its nice if it rests long enough for people to find it. Did you see in any disappointment in Jim that The Jim Henson Hour had been canceled? WHITMIRE: I never noticed it, but I think he was probably discouraged. It was a big show and it didnt happen. Do you think that disappointment could have prompted him to seek out the Disney deal? In order to perform Kermit, Steve had to get in the heart and soul of Jim Henson. Having the company grow into this big corporate thing. He just wanted to cut back and get back to just creating stuff. I think the idea was Disney would look after the publishing and licensing and the legal side of the business, and he would be able to just do work and direct and perform and that sort of thing. So that was his goal. 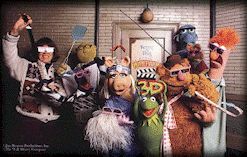 I guess the next major project after The Jim Henson Hour would be Muppet Vision 3D. WHITMIRE: Yeah. That would be the first major project we did with Disney. We did a Disney World special, but I think that came after. It was after, because the last thing we worked on before Jim passed away was the Disney World special. But the last film he directed was Muppet Vision 3D. WHITMIRE: Its pretty neat. It was a really fun thing to work on. The cameras kept breaking, but other than that it was fine. WHITMIRE: Oh yeah, we shot that on the Disney lot in Burbank. I think it was the first thing we did with Disney on the Disney lot. Nice round old age." I said, "Yeah, that sounds good to me too." That was the last kind of thing we did before we left. Muppet Vision 3D pushed the envelope in terms of it's special effects. I also had a dinner with him during that time. He and my wife and I went out to dinner in Orlando, and he was telling me that he was frustrated over the fact that I didnt have any real major characters within the core group of the Muppets. I mean I had Rizzo and Bean Bunny, but those were really the only two characters I had. He said, "I think we should work toward getting you another major character, maybe something thats like a sidekick to Kermit. Fozzie is there, but Franks not available sometimes, and it would be nice to have another character that could fill that roll sometimes." And I thought, "Great!" He said, "Yeah, Im going to go about doing that as soon as I get back to New York." So we said goodbye at the end of that project, and the next thing I know, he passed away. Shortly after that, here comes Kermit. In that respect, it was a little shocking. I remember saying to several people, "You know, he said he was going to give me a major character, but I never thought he would go to this extent." You were in Atlanta when you heard he was sick, right? It didnt even make sense. It was hard to even hear it. I just remember stopping the answering machine and saying, "Ive got to get there," and so Melissa called and made reservations. The last flight out of Atlanta to New York that night was at 9:00, and it was now like 8:15, and we live 30 minutes from the airport if you *really* make good time. Were on the far side of Atlanta from the airport. We jumped in our car and I did 140 to the airport. I was just flying. I would have been locked up forever if I had been stopped driving the way I was driving. With the exception of the speed, I was not driving unsafely, but I was flying. We have a little Porsche sports car, and I was just flying flat out. We got there in time to make the flight.
" whatever time it was, which I dont remember, "Jim passed away." And thats all he said. Everybody was just kind of devastated, and I was just kind of blank. A few tears were around, but everyone was just stunned. We just couldnt believe this had happened. How did the memorial planning come about? The memorial service was within a week, wasnt it? WHITMIRE: Yeah, they pulled it all together in a hurry, because we had all flown in from out of town. WHITMIRE: No, I dont think I did. We probably went out and bought clothes to wear for the week. We just came up without anything, because flying up there it was like, "Well, you know, hes not gonna die. This is ridiculous. Well go up for a couple of days, hell be well, and well come home." It just wasnt going to happen. The memorial was such a great thing. It was huge. There were so many people. They allowed the public to come in. It was incredible. During the memorial service, when the Muppeteers sang "Just One Person," you were up there with Wembley, werent you? All of us were crying. WHITMIRE: Its the one thing Jim requested. The rest of it was our idea. Apparently, he said specifically that he wanted just a small, little service and a Dixieland band playing "When the Saints Go Marching In." And nobody in black. I wore this ridiculous suit that was Kermit green. I looked like the Riddler. It was a real suit, with the exception that I made a Kermit collar to go up under the collar of the shirt in place of a tie. It was a white suit, and one of the guys from the shop dyed it Kermit green. He did the shoes and socks, also. When was the decision made to pass Kermit to you? Other puppeteers. I was shocked and almost kind of offended by people saying that, because it had never crossed my mind in the least. It didnt matter. That wasnt what it was about. It was about Jim. WHITMIRE: Yeah, I think they figured his son would do it because Brian had done some performing, and people still come up to me and think Im Brian. 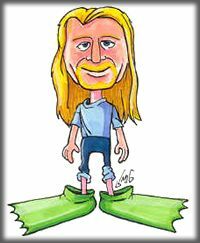 Especially when Brian had long, blond hair. like Ernie and Kermit. I can do a pretty good Swedish Chef, that kind of tone. I cant really do a Rowlf voice. In terms of the other aspects, not just his performing but from the company, theres Brian and Jims other children that are involved. Jocelyn Stevenson said at the service that we were all "Jims seeds," and were all going to float around in the air for awhile, and then we would take root. Do you think the decision for Kermit was something that he determined ahead of time? WHITMIRE: I dont know. That would be a good question to ask somebody like Brian or Frank, because I dont know the real story. I have been told that Jim had mentioned something about it to Frank. Not that I would perform Kermit when he died, but that he might need to get somebody else to do Kermit some of the time because he was so busy. He never said that to me, but I heard that through somebody that it had been talked about. Just that the two of them were so busy, that they may have to find stand-ins to do their characters sometimes, so I guess it had been mentioned, but the actual time I was asked was by Brian. We were in Disney World for something. Im not sure exactly what it was, but I think it was for the big tribute they did to Jim, and we went down for that. While we were there, one night I went over and met with Jane Henson, Brian, and Frank, and Brian mentioned me doing it. I was just overwhelmed by the request. It was a huge honor, and it also just scared the daylights out of me, the thought of trying it. Steve Whitmire has done some great interviews as Kermit the Frog, including this May 1998 appearance on Good Morning America. It really did. I took this puppet and I put it on, and I had Kermit on before while fooling around in the shop, but I had never performed him. So I put him on, and I was standing in front of a mirror and I held him up, and I sort of had him turn around to me, and I really got this sense of this voice in my head of Kermit saying, "Cmon, I need to talk. Do a voice." I could not do it. I just took the puppet off, set it on a shelf in another room, and I didnt touch it for almost a month. I couldnt go near it. I couldnt do the voice. Finally, I got a call from Brian who said, "We kind of need you to do something. Could you do something and put it on tape and send it to us?" I did "Bein Green." They sent me down the orchestral track, and I sung it and did a version of that and sent that to them just to evaluate. I was feeling real uncomfortable about it, particularly about the voice. I just felt really uncomfortable about the voice. I kind of knew the character. Id been around Jim when hed done a lot of Kermit for around 13-14 years at that point, but there were two things that really nailed it for me.
" and I thought, "Thats awful. It doesnt sound anything like Kermit. What am I gonna do? Franks going to come in and Im going to just be terrible!" I was so nervous about it. Once I got over the fear about what everybody else was going to think about it, I was fine. It was easy to get over that because everybody was very accepting about it. But that day when Frank came in, I worked at lunch time, and he came in at lunch and we worked for several hours and put some things on tape when he started doing his characters, Kermit just came alive. It was as though there was a chemistry between the characters that survived either of the two men. You just need Fozzie for there to be a Kermit, and you just need Piggy for there to be a Kermit. Piggy is a certain way when shes around Kermit, and Kermit is a certain way when hes around Piggy. So that just gelled. We did some really goofy stuff ad-libbing, and Frank said, "It looks perfect. Just continue to keep working on the voice." Which I did. I felt great after that day. I felt so much more confident with Frank basically giving me his blessing saying, "Youre doing all right. Its not bad." 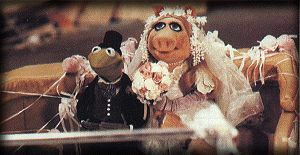 The chemistry and depth of Muppet characters like Kermit and Piggy is what separates them from many other character icons.